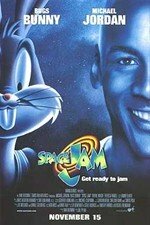 It's a slammin' mix of live-action and animation, as basketball superstar Michael Jordan is "hijacked" into the cartoon world of Bugs Bunny, Daffy Duck and the rest of the Looney Tunes crew to help them when they're forced to play a game of hoops against a gang of alien behemoths who've stolen the talents of the NBA's top players. Wayne Knight, Bill Murray, and the voices of Danny DeVito and Billy West are also featured. 88 min. Standard and Widescreen (Enhanced); Soundtrack: English Dolby Digital Surround, French Dolby Digital Surround, Spanish Dolby Digital Surround; Subtitles: English, French, Spanish; audio commentary; featurette; bonus cartoons; music videos; more. Two-disc set. Have question about this movie and couldn't find the answer here? Use the search feature to find your answer now or ask us directly at Our Contact Page! Why not be the first to review this movie and get published here? Two-disc set includes "Space Jam," "Osmosis Jones," "Looney Tunes Back in Action," and "Funky Monkey."